Pattu walked down, groggy with sleep, sleepiness a cloud around her face. I turned to hold her and then pushed her away to go brush. I did not look at her choosing instead to saute cauliflower, the hot pan sizzling and steaming, obscuring not just my tears. Her anguish was unexpected as she said No and walked upstairs as despondent as I felt. The previous day has been an exercise in positivity. Ammu, Pattu and I had driven to the polling station and taken our positions in a line that snaked its way to the entrance of the local church. We made eye contact, smiled at a few and waved at fellow pantsuiters. We inched forward methodically, patiently for an hour and half before we sat in a booth, paper ballot in hand. The two of them watched as I marked my vote for Hillary Clinton and we took a moment to send a prayer for her to shatter the highest glass ceiling there is. My daughters held the ballot as the machine swallowed it and proudly held the ticket which proclaimed that we voted. We sat in the cafe of the church watching other poll goers and snacked on bagels. It was mid morning before we walked out into a clear day promising hope. The day wore on and anxiety settled in the pit of my stomach like an ache that I could not ignore. I put the girls to bed and sat in front of the television opting to skip NaNoWriMo in favor of watching history being made. Instead I watched with horror as the nightmare unfolded. As state after state went too close to call and eventually turned a shade of crimson, my hopes died out, embers dying in a stack of ashes. I tossed and turned, unable to sleep. Unable to make sense of what had happened. Devastated was how I felt as my Facebook feed filled with people sharing their angst. Amid the sadness was a thread that emerged. People I knew in passing liking posts about the shocker that the election results were. Curious, I turned to political analysis, finding and narrowing down results for the county in which I live. As a county we voted for Clinton but the lead was narrow. I looked at the numbers, parsing it. 1 out of every 2 persons who voted did so for Trump. 1 out of every two people condoned his mocking of people with disabilities, his incessant bragging about sexual assault, his refusal to release taxes, his zero experience with governing, his known record for stiffing businesses and his staff, his overt islamophobia, his homophobia. These were people I knew, lived amidst, interacted with. These were people teaching my children at school. These were people telling their children that once Trump became president, my children would be sent back to Mexico and there would be no Taco Tuesdays. These were the people that stood in line yesterday as I kept my children close to me wondering what a person of color was doing with white children in her care. These are the people who will greet me and my family at the immigration counters and make decisions based on how I look rather than my citizenship. These are people who, protected by the privilege that whiteness brings will make judgments that will affect my daily life. I am aware I have always lived amidst these people, the only difference is that I know now what I could have only suspected before. As the mother of growing daughters who look to the society around them for inspiration, I reveled when I could play them clips of Secretary Clinton or our First Family. These were snippets I could read, let them watch without having to cringe or explain. I have had to be wary around what was being said when our current President Elect was on television. I have had to switch channels when election propaganda by Trump aired. Today as Pattu walked upstairs, shoulders slumped, I felt the weight of everything that happened overnight descend on me. I wanted to hold her and tell her that everything will be OK. Just that I had no confidence it would be. My beautiful Laddu will grow up in a world tilted towards sexism and misogyny at the highest levels of government. She will be judged based on the color of her skin rather than the person she is and that will have sanction from places that have been progressive before. As much as I want to believe this is just four years or that things will change, I fear what we are seeing now is a descent into untapped angst. A fear that has no reason. An upswell of all things that will take us back to the Americas of the fifties. I fear for my children. I fear for us. I fear for America. 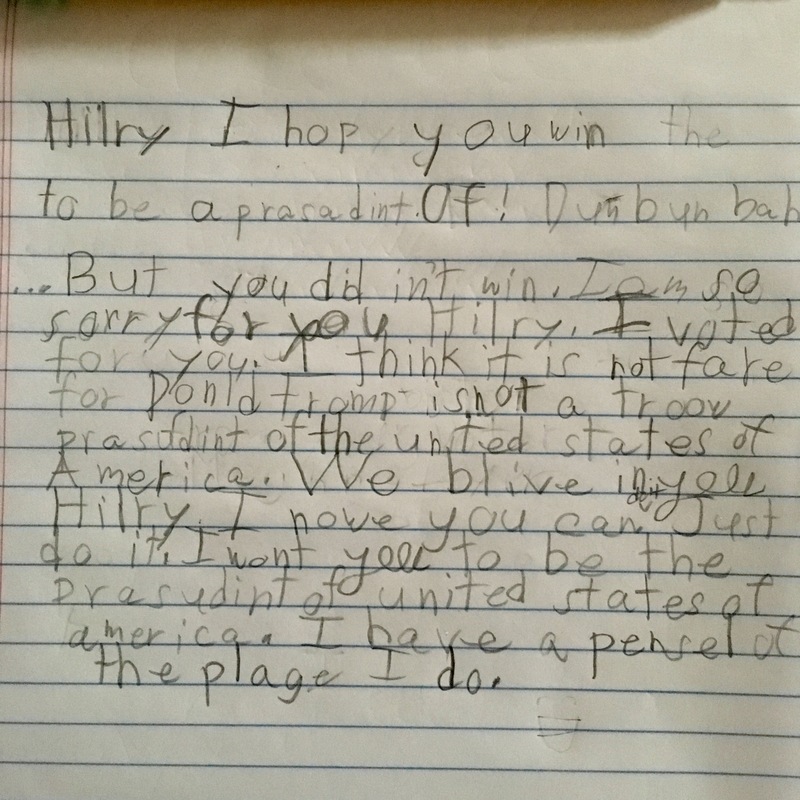 **The picture is a letter my daughter wrote to Hillary Clinton. Next Beating The Blues, Tomorrow. And the too shall pass, Laksh. It is always darkest before dawn.